Your purchase supports Upstate's Pediatric Pulmonary Sunshine Fund. The fund helps families of children with Cystic Fibrosis with medical needs not covered by insurance. Cystic Fibrosis is a life-threatening disease affecting the lung and digestive system. There is no cure. Some 1,000 children are diagnosed with CF each year. 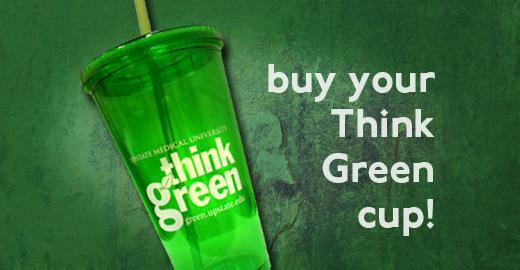 Your reusable cup eliminates single-use water bottles from landfills and saves you money on expensive bottled water! For information on how you, your department, your team, your class can become involved in Upstate's Think Green program, contact us at green@upstate.edu. See more Did You Know… topics. Last Modified: March 23, 2018. Contact Erin Peters with questions about the content of this page.